An emergency worker misheard a recording as part of an unscheduled drill. The Hawaii employee who sent out a false alarm earlier this month warning of an incoming missile attack said he misunderstood a drill and believed that a ballistic missile had actually been fired, authorities said Tuesday. Even more alarming, officials said this was not the first such mix-up for the employee. At least twice before the false alarm, he "has confused real life events and drills," a state investigation concluded, part of a troubled work history that had "been a source of concern ... for over 10 years" to his coworkers. 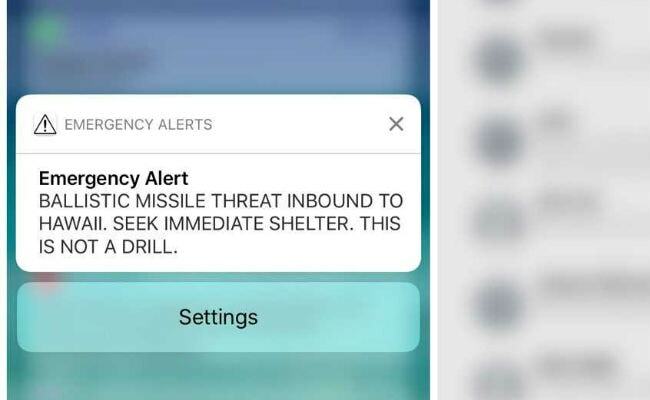 The false warning blasted out to cellphones across Hawaii on Jan. 13 had somber consequences, sending waves of panic across the state at a time of heightened tensions with North Korea and renewed fears of nuclear attacks. Exacerbating the terror, the message blaring "BALLISTIC MISSILE THREAT INBOUND TO HAWAII. SEEK IMMEDIATE SHELTER. THIS IS NOT A DRILL." went uncorrected for an agonizing 38 minutes. A federal investigation said the employee believed there "was a real emergency, not a drill," which contradicted explanations previously offered by Hawaii officials, who have said the alert was sent when an employee hit the wrong button on a drop-down menu. Authorities were apologetic after what Gov. David Ige, D, had previously called "a terrifying day when our worst nightmares appeared to become a reality." Ige and other officials defended their public response to the false alarm on Tuesday, and they pledged to continue improving the state's Emergency Management Agency. "What happened on January 13th will never, ever be repeated again," Ige said at a news briefing. The employee who sent out the alert was fired last week and has not been publicly identified. State officials said his name will only be officially released once any appeals to the disciplinary process are finished. It was not clear if the employee contested his firing or disputed the public account of what happened and his history. A spokesman for the Hawaii Emergency Management Agency did not immediately respond to a request for comment Tuesday. The agency's top official -- Vern Miyagi, administrator of the Hawaii Emergency Management Agency -- "has taken full responsibility" for the incident and resigned Tuesday, said Maj. Gen. Joe Logan, the state adjutant general, who oversees the department. The state investigation released Tuesday described the employee who sent out the alert as having a poor history dating back for years, with other members of his staff saying they did not feel comfortable with his work. While the employee was counseled and corrected on the spot after previous issues, state officials said, he remained in his position. The state report describes a frenzy of activity after the false alarm was issued, but even as some employees began notifying others, the employee who sent the alert was "sitting and seemed confused." Other workers were given mental health counseling after the false alarm, the report stated. Hours before Hawaii officials released their findings, the Federal Communications Commission published its own preliminary report saying that the state employee claimed to have sent out the alert because he did not realize a drill was underway. The incident began when a night-shift supervisor decided to test incoming day-shift workers with a spontaneous drill, the FCC report stated. The supervisor managing the day-shift workers appeared to be aware of the upcoming test but believed it was aimed at the outgoing night-shift workers. As a result, the day-shift manager was not prepared to supervise the morning test, the FCC said. Following standard procedures, the night-shift supervisor posing as U.S. Pacific Command played a recorded message to the emergency workers warning them of the fake threat. The message included the phrase "Exercise, exercise, exercise," the FCC report said, but it also included the "This is not a drill" language used for real missile alerts. The worker who then sent the emergency alert said they did not hear the "exercise" part of the message. This person declined to be interviewed by investigators, but he did provide a written statement, the FCC said. Retired Brig. Gen. Bruce Oliveira, the internal investigating officer tasked with investigating the incident, said he received the written statement from the fired employee -- identified in the report as "Employee 1" -- two days after the false alarm. But that statement had to be investigated and compared with what other people said, Oliveira. Authorities in Hawaii defended not releasing the fired employee's explanation earlier. "General Oliveira was tasked with doing a fair and impartial assessment, and he needed to interview all of the employees and everyone involved in the process," Ige said. "I think it would be unfair to release statements collected piecemeal. Certainly it wouldn't allow a full and complete evaluation of the event as it occurred if you're releasing statements ... one at a time." In his report, Oliveira blamed a combination of "insufficient management controls, poor computer software design, and human factors" for both the ballistic missile alert and the delayed correction. Amid criticism of how long it took officials to correct the mistake, Ige has said his response on Twitter was delayed because he had forgotten his account's password. Three minutes after the message was sent, the day-shift supervisor received the false alert, and the process of responding to the mistake began. The state emergency management agency notified Ige of the problem. Seven minutes after the alert was sent, officials stopped broadcasting it. But because there was no plan for how to handle a false alert, the agency could not issue an official correction. It was not until 26 minutes into the crisis that officials settled on a proper way to inform the public about the all-clear, and workers began drafting a correction. It took another 14 minutes after that for the correction to be distributed. The lack of a contingency plan reflected a critical failure on the part of Hawaii's emergency management agency, said Ajit Pai, chairman of the FCC. "Every state and local government that originates alerts needs to learn from these mistakes," Pai said Tuesday. "Each should make sure they have adequate safeguards in place . . . The public needs to be able to trust that when the government issues an alert it is indeed a credible alert." The false alert on Jan. 13 was not checked by the Hawaii emergency management agency's computer systems because there is little difference between the user interface for submitting test alerts and the one for sending actual alerts. "Hawaii's alert software allows users to send live alerts and test alerts using the same interface," said James Wiley, an attorney adviser at the FCC's Public Safety and Homeland Security Bureau. Wireless emergency alerts warning of danger are typically sent out by state and local officials through a partnership between the FCC, the Federal Emergency Management Agency and the wireless industry. Practices vary from state to state over how they handle such alerts. In Washington state, for instance, any message about a possible missile alert would "undergo layers of scrutiny before it was sent," Karina Shagren, spokeswoman for the Washington Military Department, wrote in an email. Shagren said her state only has two pre-written alert messages -- one related to tsunamis, another to volcanic activity -- and each warning requires at least two people to approve before they are sent. Hawaii authorities said that they now require additional approvals before alerts and tests are transmitted. The state suspended emergency alert drills after the false alarm and also plans to provide more warning before drills. Officials in Hawaii also say a second person will be needed to confirm sending out alerts. When the false alarm splashed across cellphones on Jan. 13, people began frantically trying to determine how long they might have to reach safety. Some sought shelter in their homes, while others described "mass hysteria" on the roads. The alert came at a fraught moment for people in the western United States, with a war of words between President Trump and North Korean leader Kim Jong-Un stirring unease about a potential attack on U.S. soil. Hawaii, given its location in the Pacific, stands as a possible target of a North Korean attack. In a remarkable sign of concern, Hawaii last year brought back its statewide Cold War-style siren to warn of a potential nuclear assault. Navy Cmdr. David Benham, a Pacific Command spokesman, said in an email Tuesday that his headquarters is using the incident as an "opportunity to improve our internal processes as well as coordinate with state authorities." He declined to comment on the specifics of those procedures, citing security concerns. In a separate action Tuesday, the FCC voted to approve new requirements designed to enhance the geo-targeting of cellphone alerts. This move is aimed at making the distribution of alerts more accurate so that those outside of an emergency area will not receive warnings that do not affect them. The FCC will also require cellphone carriers to allow consumers to review any alert for up to 24 hours after they receive them. Carriers will have until November 2019 to implement the changes. The Washington Post's Dan Lamothe contributed to this story.